creating the information systems and capability to assess performance and implement rapid cycle changes. the funding of Health and Wellness Funds at the state and local levels. The diversity of interests, structures and objectives is valuable because it increases the likelihood that a given intervention will find a good match, however, it also raises the specter of fragmentation and conflicting efforts. The challenges and opportunities for improving population health vary widely from community to community. Achieving the goal of reduced disparities and better quality of life will require implementing a combination of interventions that are tailored to each community’s needs and that enhance each other, thus generating a community multiplier effect. Simply implementing an uncoordinated series of interventions is unlikely to be either effective or sustainable. To avoid this, the CHS would use a solid grounding in the determinants of health to create and manage a portfolio of interventions that is balanced along the full spectrum of three perspectives: (1) time frames for effects of interventions, (2) the level of scientific evidence (investment risks) and (3) scale of return using both health and financial metrics. Table 1 illustrates how the CHS integrator organization would partner with other organizations to create a balanced portfolio that includes interventions with short, medium and long term impacts. Using its needs assessment process, it would prioritize interventions and combine them into a coherent strategy that realized short term opportunities for savings in medical costs, implemented medium-term interventions for changing risky behaviors and addressed longer-term upstream determinants of health such as early childhood development and the built environment. For each intervention, the CHS would identify an implementation partner with the appropriate skills (as well as a financing vehicle), facilitate the connection, and provide oversight to monitor results. In many cases, the CHS would also play a key role in identifying and securing financing. The more innovative financing vehicles are transaction driven. Just as securing a mortgage on a house is specific to the particular owner of a specific house, closing on financing for a given intervention would be based on a specific intervention managed by a specific service provider in a specific place. Closing each deal would require a thorough feasibility study that documents both the business case of the financial flows and the capabilities of the organizations involved. Matching the time horizon, risk profile and returns of each intervention with the appropriate organization and financing vehicle, negotiating the agreement governing the relationship, and monitoring performance would be critical responsibilities of the CHS. These have not been identified previously as essential functions for population health improvement. 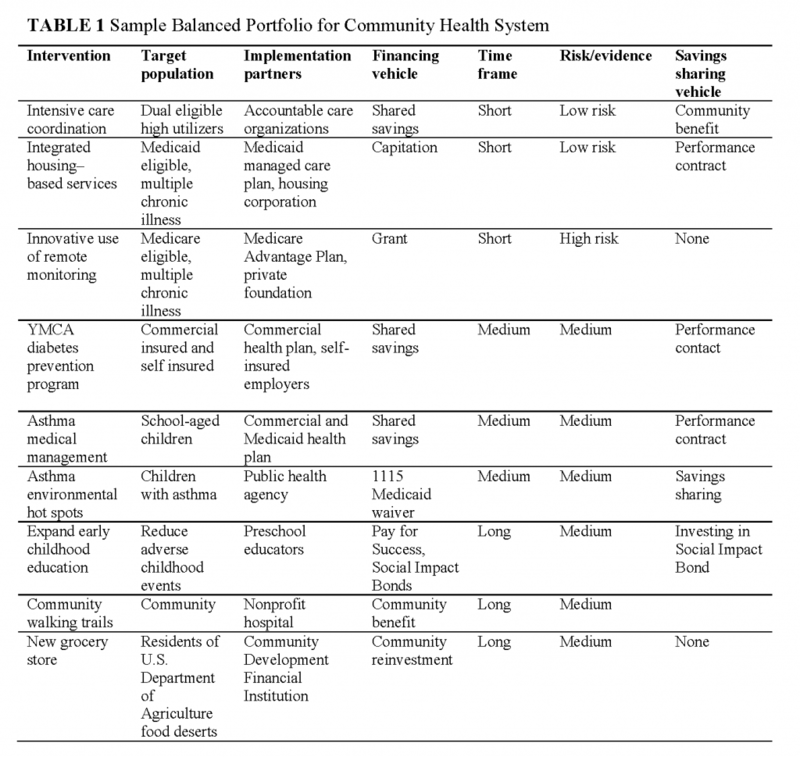 The sample portfolio in Table 1 shows the intervention, target population, implementation partner, financing vehicle, time horizon and risk profile for nine interventions targeted to address the needs of a hypothetical community. The combination covers a broad cross-section of the population and represents complementary efforts to improve the management of chronic illnesses, support changes in risky behaviors and change upstream determinants of health such as the built environment. primarily from shared savings. In each case, the CHS would have to demonstrate a clear added value to the transaction to justify its sharing in the results. Understanding the specific ways it could do this is an area in which we have much to learn. The financial model presented here is conceptual, not based on current experience. Although a variety of examples of community-based structures for improving the health of the population exists, no single organization has either the full range of competencies required for the integrator organization as described here, or the accountability to manage a broad spectrum of interventions with shared savings flowing to a Health and Wellness Fund. The next 3-5 years will be an important period of experimentation and development to translate this concept into a scalable reality. The timing is critical for a number of reasons. First, the innovative financing vehicles appear poised to develop and spread very rapidly with little, if any, focus on coordination with other population health initiatives in the community. This creates the very real danger that they will outrun our ability to create community-based structures to integrate them effectively to meet local needs. Second, there is not an unlimited pool of potential savings to be harvested and once the savings are gone, it will be more difficult to create a balanced portfolio. Third, the community development and population health movements are evolving on parallel tracks in creating community integrator structures. The last thing we need is to have dueling community infrastructure. The State Innovation Models program created by CMS will provide a major opportunity for states to help test alternative approaches to a community integrator. The Transformation Plans of several states such as Washington and Minnesota explicitly call for the development of CHS’s and other states, such as Oregon, Colorado and Maryland are creating a regional accountability framework that could be a starting point for a CHS. Learning collaboratives such as the Robert Wood Johnston Foundation’s Aligning Forces for Quality and the Institute for Healthcare Improvement’s Triple Aim Collaborative, are other promising sources for early adopter organizations. It is essential that the public sector and private foundations combine resources to test how to create sustainable financial models and community-level infrastructure to support and reward improvements in the health of the population. Without them we will not be able to maintain the hard won gains in expanding coverage for millions of Americans, or improve their health status. Auerbach, J., D. I. Chang, J. Hester, and S. Magnan. 2013. Opportunity knocks: Population health in state innovation models. Discussion Paper, Institute of Medicine, Washington, DC. Berwick, D.M., T.W. Nolan, and J. Whittington. 2008. The Triple Aim: Care, health, and cost. Health Affairs 27(3):759-769. Cantor, J., L. Mikkelsen, B. Simons, and R. Waters. 2013. How can we pay for a healthy population? Innovative new ways to redirect funds to community prevention. Oakland, CA: Prevention Institute. Chang, D. 2012. Integrator role and functions in population health improvement initiatives. Nemours. http://www.improvingpopulationhealth.org/Integrator%20role%20and%20functions_FINAL.pdf (accessed November 27, 2013). Erickson, D., I. Galloway, and N. Cytron. 2012. Routinizing the extraordinary. Investing in what works for America’s communities. http://www.whatworksforamerica.org/the-book (accessed November 27, 2013). Halfon, N. 2012. Transforming the child health system: Moving from Child Health 2.0 to 3.0. Aspen Institute’s Children’s Forum presentation, July 23. http://www.aspeninstitute.org/sites/default/files/content/docs/psi/TransformingtheChildHealthSystem-HalfonNeal.pdf (accessed November 27, 2013). Hanleybrown, F., J. Kania, and M. Kramer. 2012. Channeling change: Making collective impact work. Stanford Social Innovation Review. http://partnership2012.com/download/Collective%20Impact%20II.pdf (accessed November 27, 2013). Hester, J. A. 2013. Paying for population health: A view of the opportunity and challenges in health care reform. Discussion Paper, Institute of Medicine, Washington, DC. http://iom.edu/Global/Perspectives/2013/PayingForPopulationHealth (accessed March 3, 2014). Hester, J., J. Lewis, and A. McKethan. 2010. The Vermont Accountable Care Organization Pilot: A community health system to control total medical costs and improve population health. Commonwealth Fund, 1-22. http://www.commonwealthfund.org/~/media/Files/Publications/Fund%20Report/2010/May/1403_Hester_Vermont_accountable_care_org_pilot.pdf (accessed November 1, 2013). IOM (Institute of Medicine). 2012. For the Public’s Health: Investing in a Healthier Future. Washington, DC: National Academies Press. http://www.nap.edu/openbook.php?record_id=13268 (accessed March 3, 2014). Magnan, S., E. Fisher, D. Kindig, G. Isham, D. Wood, M. Eustis, C. Backstrom, and S. Leitz. 2012. Achieving accountability for health and health care. Minnesota Medicine 95(11):37-39. Milstein, B., J. Homer, P. Briss, D. Burton, T. Pechacek. 2011. Why behavioral and environmental interventions are needed to improve health at lower cost. Health Affairs 30(5):823-832. Shortell, S. M. 2013. A bold proposal for advancing population health. Discussion Paper, Institute of Medicine, Washington, DC. http://www.iom.edu/Global/Perspectives/2013/BoldProposal (accessed March 3, 2014). Sprong, S., and L. Stillman, 2014. Leveraging multi-sector investments: New opportunities to improve the health and vitality of communities. Health Resources in Action. http://hria.org/uploads/reports/PPReport_r3_011614_pages.pdf (accessed November 27, 2013). The views expressed in this discussion paper are those of the authors and not necessarily of the Institute of Medicine. The paper is intended to help inform and stimulate discussion. It has not been subjected to the review procedures of the Institute of Medicine and is not a report of the Institute of Medicine or of the National Research Council.